Be rewarded for your loyalty with new Basingstoke shopping scheme!! Shoppers in Basingstoke can now reap the benefits of supporting the Hampshire high street as a new loyalty card scheme has been launched to encourage residents to love local. 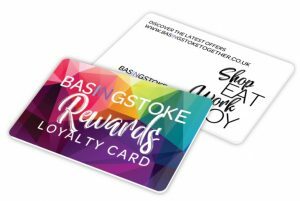 The Basingstoke Rewards scheme, which is available from today (Thursday 1 November) courtesy of Basingstoke Together, gives shoppers access to a wide range of offers and discounts. A wealth of Basingstoke businesses and national chains are supporting the scheme including shops, restaurants, solicitors, recruitment agencies, insurance companies, sports and leisure facilities. The card boasts discounts including 10% off in Topshop, Monsoon, Accessorize and Yankee Candle as well as 20% off in Zizzi, a month’s free membership at Anytime Fitness, 40% off Taylor’s Hair & Beauty plus many more. Lucy Boazman, Chief Executive of Basingstoke Together, said: “The new Basingstoke Rewards card is packed with brilliant ways to save money from an impressive range of retailers throughout the town centre. Basingstoke Together is the public face of the Basingstoke Business Improvement District (BID). The BID’s aim is to help Basingstoke town centre to thrive by creating destination events, engaging with consumers and supporting retailers and businesses. The organisation hopes that the loyalty card will encourage more shoppers to visit Festival Place, The Malls and the Top of Town as value-for-money shopping destinations. Shoppers can save every time they make a purchase at participating venues by showing the specially created loyalty cards. The card, which will be valid until 31 March 2021, costs £2 as a one-off purchase and it is available from the Basingstoke Together website from today (Thursday 1 November).